Whether you just started grilling or have been doing it for a long time it is always important to remember safety. 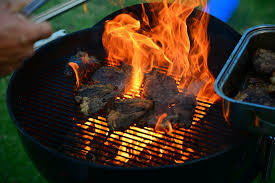 Many house fires are started from unsafe grilling practices. It takes no time to ensure safety is being practiced before your next barbeque. All grills come with instruction manuals: Read them. They contain lots of safety tips specific to the type of grill. However, if you refuse to do this, here are some tips to keep the family safe. Always inspect your grill before using it. If it uses gas, check the hoses for any damage. This can be accomplished by covering them with soapy water. A leak will become clear and will be indicated where on the hose. If it has been used, look at the inside and under the unit. Metal grills can be rusted and damaged, allowing hot charcoal to fall through. A common cause of fires is grease. Give the grill a thorough scrub before deciding to light it. Grease build up will cause flare-ups and feed the fire more than you expect. Always keep the grill at least 10 feet from any structures. Look up, down, left and right to make sure nothing is close enough to catch on fire. Once you find a safe distance from objects, place the grill firmly on the ground. It should not rock; it must be stable. Check for low hanging branches above and place a pan under to catch anything dripping. A hot grill needs to be treated as a danger zone. Keep everyone away from the flames including kids, pets and other adults. Any clothing that is loose or hanging can reach the fire and be lit. Whoever is handling the cooking will be prepared for this, but others may not be. This rule applies to anything flammable as well. If the wind can blow it near the flame, keep it at a safe distance. Napkins are commonly placed near the grill; however, these can easily be blown into the flame. Even though all precautions have been taken, a fire can still happen. Be ready to put out any fire that flares up. Having a little bottle of water can be utilized for a small flare up. When fighting a bigger fire, have a fire extinguisher close by. Using sand is another way to put out a fire if an extinguisher is not available. DO NOT use water for grease fires. NEVER be afraid to call 911. Once the fire is going always have a set of responsible eyes on it. People going in and out may forget the rules, so a constant reminder will prevent any mishaps. Plan and have someone designated to watch the grill while you leave for any reason. Even after the cooking is done the grill is still dangerous. Grills will remain hot for several hours after being used. Keep the same safe distance from the house and from anyone attending the barbeque. If using a gas grill, completely turn off the gas and close all vents. Allow the flame to die out due to lack of oxygen. For coals, it will take some time for them to be completely cool. It is best to close the grill and let the coals cool for the night before throwing them out.